Bring the rustic, old-world look of sunny Tuscany into your kitchen or bathroom with painted Tuscan cabinets. This is a perfect finish for tired, worn cabinets, and it requires little expertise. In fact, it's OK to be messy. 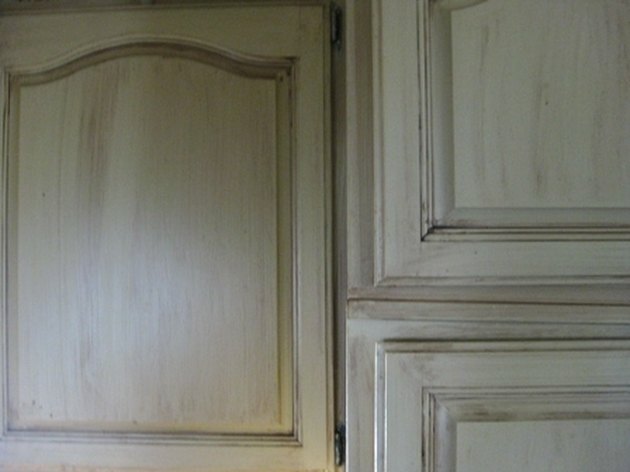 With the right color of paint and some stain, the cabinets can look one hundred years old and oh so cool. Choose a Tuscan-inspired base color paint, which will be darkened with stain. This can be an oil-based stain, which you'll add to oil faux glazing medium for a translucent effect. An alternate and faster-drying method is to have the paint store add some dark colorant to water-based glazing medium. Decide whether you're going to take all your cabinet doors off, paint and stain them elsewhere and put them back on, or do everything in place. It's easier to do the latter, and since this is a "rustic" effect, being a little messy around the edges can just add character. Thoroughly scrub and sand your cabinets. Prime with a shellac or oil-based primer for the finish paint to stick. Caulk and fill obvious gaps and holes, including the gaps where the cabinet meets the wall. Paint the cabinets with one or two coats of good-quality latex satin paint in your base color. Make the job go faster by using a 4- to 6-inch mini roller. Always brush the edges and corners first, then roll, to minimize brush marks. Allow to dry at least eight hours. Using a soft faux brush, apply the stain glaze liberally, working in the same direction as the grain of the wood. Work in sections, a single door or side of the cabinet box at a time. The glazing medium retards the drying time, so you have at least 30 minutes before it starts getting sticky. Wipe the stain glaze with a dry, lint-free rag, again working with the grain of the wood, until you're happy with the hand-rubbed finish. This naturally leaves darker color around crevices and wood details. You can also use a very fine bristled faux blending brush to add subtle brush strokes and fill in areas that look too light. Follow label directions and allow the stain glaze to dry completely. Put a protective coat of varnish over your new Tuscany finish. If you used an oil glazing medium, use an oil-based varnish. A water-based glaze can be sealed with either oil or water-based varnish. Add antique--or antique-looking--knobs and drawer pulls to complete the Tuscany look. Mismatched knobs can look very fun and funky.